A lot of the time, when people do hip openers in yoga, they focus on the poses that help open the outer hips like pigeon pose. Don’t get me wrong—those poses feel amazing, for desk jockeys and runners alike. But, if you only work to open the muscles in your outer hips and seat, you can wind up with imbalances if you don’t open your inner thigh muscles, too. Those imbalances can easily lead to injury. So, be sure to include some inner hip openers, like the ones featured below, to even things out! DISCLAIMER! I’m a yoga teacher, but I’m probably not your yoga teacher. Always ask your teacher if you have a question about how to modify a pose for your body, and always ask a doctor before starting any exercise regimen. As with any yoga pose, if it doesn’t feel right, don’t do it! You’ll often hear this pose called either Butterfly or Bound Angle Pose (Baddha Konasana). 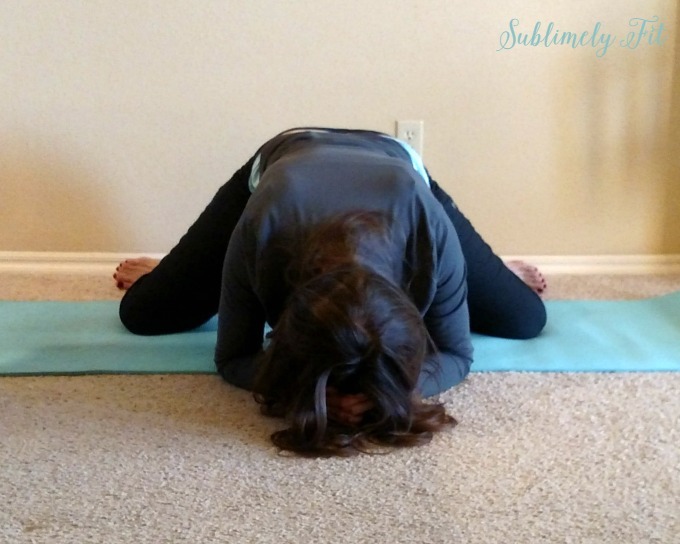 This is a great pose to start with when you’re working to open your inner hips. 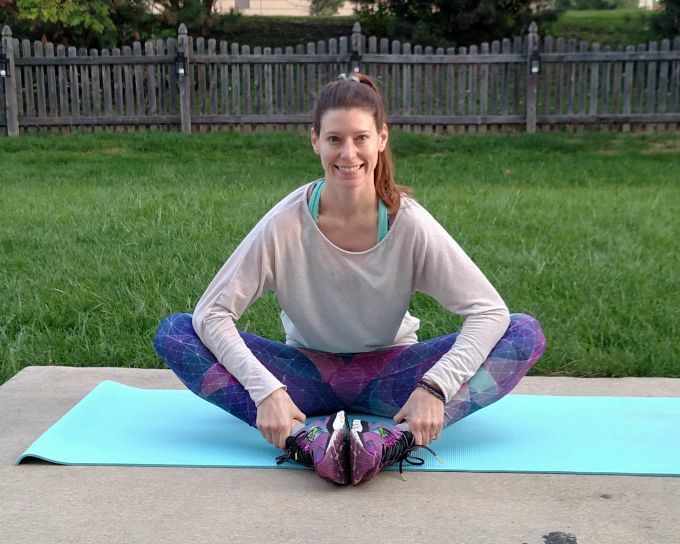 If you’re really tight or need extra support, you could put yoga blocks or a folded blanket under your knees. (Or, even under your head for a restorative pose.) As you begin to open more, you can use your elbows to gently press your knees toward the ground, like you see me doing in this photo. Remember that it’s always better to have a nice, comfortable stretch than to push too hard. You’ll gain flexibility faster that way. Reclined Bound Angle Pose (Supta Baddha Konasana) is one of my very favorite poses to relax down into. 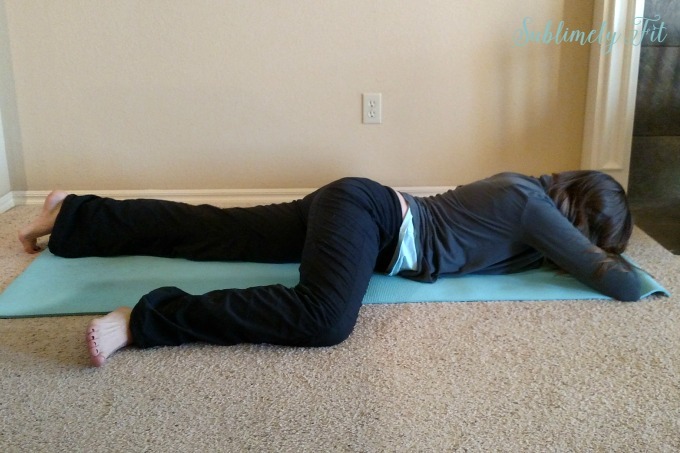 Like with the seated Bound Angle Pose, you can always place blocks or a folded blanket under your knees to help support them. That extra support can actually help you build flexibility faster! I actually like to meditate in this pose, too, from time to time. By placing a hand on my sternum and a hand on my belly, I can feel my chest and belly rise and fall with my breath. That physical sensation makes it easier to bring my attention to my breath, helping me drop my thoughts. I love Goddess Pose not only because it makes me feel strong and amazing, but it also helps open the inner hips and strengthens the thighs, too. It’s also a great way to start to warm up your inner thighs and hips a little more to open into deeper stretches. Make sure to keep your knees stacked above your ankles to protect them! Garland pose is deeper and more intense than Goddess Pose. 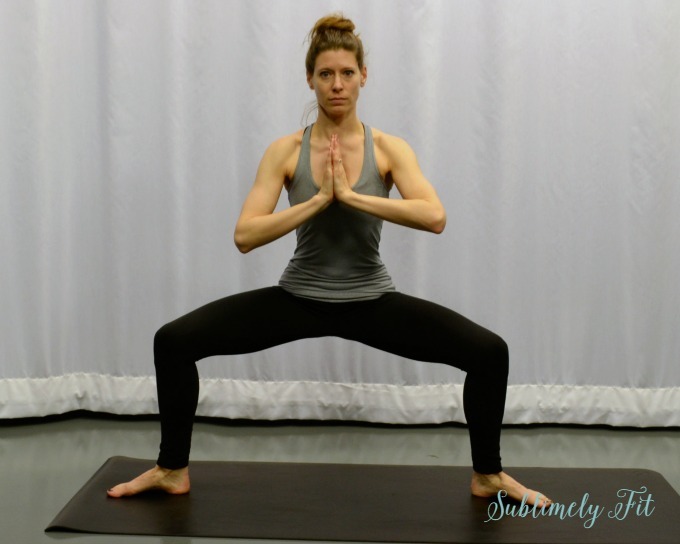 When you’re just starting out with Garland Pose, I recommend sitting on a yoga block. The block will help support you as you begin to teach your body how to open your inner hips and thighs. Once you’ve been practicing for a while, you can choose to use your elbows to help press your knees and inner thighs open slightly to intensify the pose. Half Frog Pose is a nice way to let gravity help you open your inner hips. I’d recommend starting to open your inner hip and thigh muscles with a pose like Bound Angle or Reclined Bound Angle before coming into Half Frog. Once your body has loosened up a bit, you can come into Half Frog on one side, bringing your knee straight out at hip level and keeping a 90 degree angle in your knee. The other leg simply relaxes below you. Be sure to breathe, and hold the pose for the same length on both sides, from a minute to several minutes. This is not, I repeat, NOT a pose for beginners! But, if you’ve been working on opening your inner hips for a while, you can give full Frog Pose a try. It’s important to keep your knees at 90 degree angles, and you’ll want to keep your feet flexed, too. This pose is just as much mental as it is physical. It’s very intense! The key is to work with your mind to get your body to relax, not resist the pose. Only start to work on Frog when your body is ready and open. Until then, Half Frog is a much better pose to practice. I hope these help your hips feel better! Linking up with Running on Happy, Suzlyfe, Crazy Running Girl, and Coach Debbie Runs for Running Coaches Corner! I’ve been working with a client on opening up her hips, and this is perfect! It also lets me know that I’m on the right track–I’ve been doing the same ones with her!